2019 Tour Schedule - ONLY A FEW SEATS LEFT! $100 roommate discount available! See Discounts and Coupons below for details. 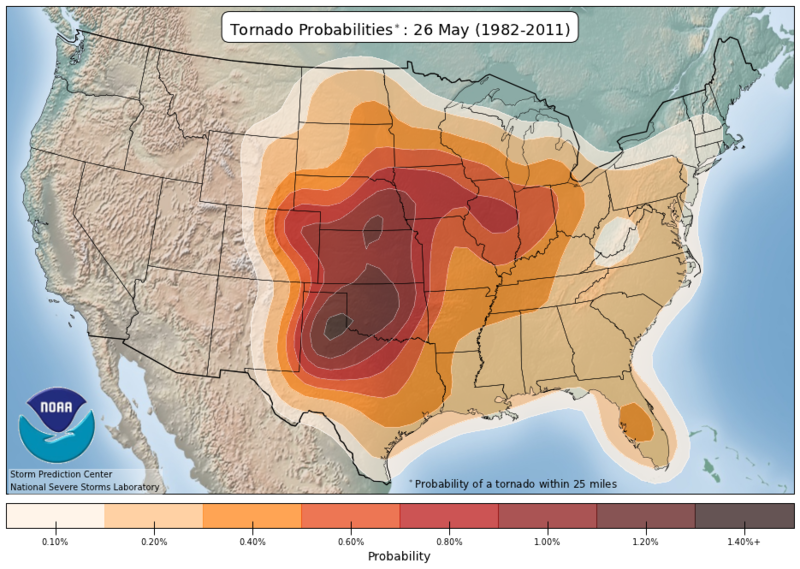 Click "Tornado Probability" for each tour's tornado climatology chances and locations. $200 roommate discount available! See Discounts and Coupons below for details. 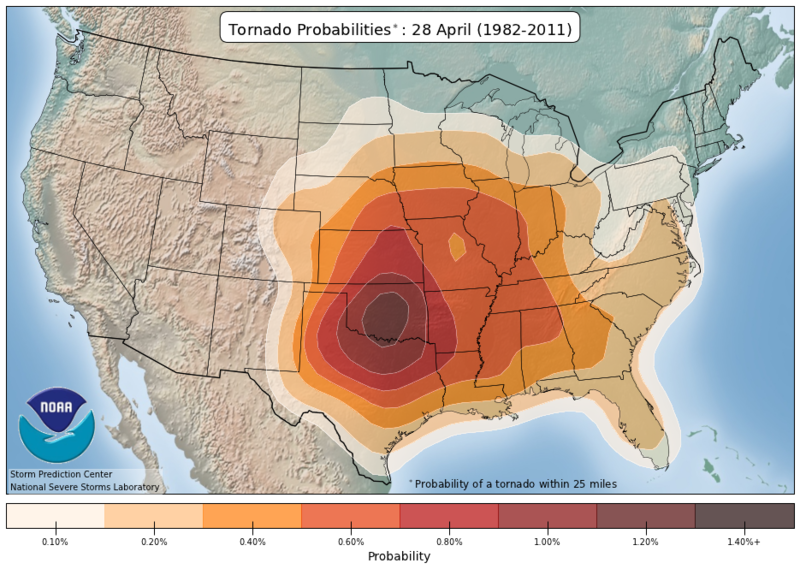 Tornado Probability 6 May 2 May 3 May 9 OKC $2400 NOW BOOKING! 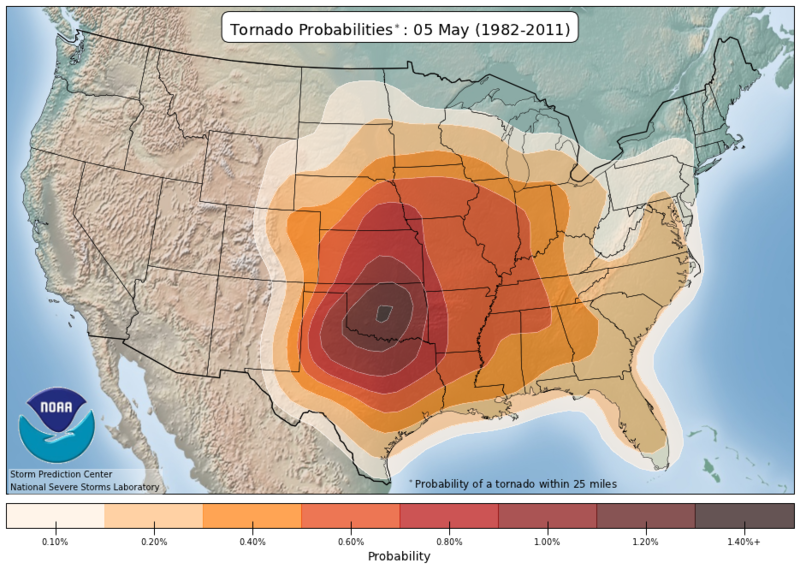 Tornado Probability 6 May 9 May 10 May 16 OKC $2400 NOW BOOKING! 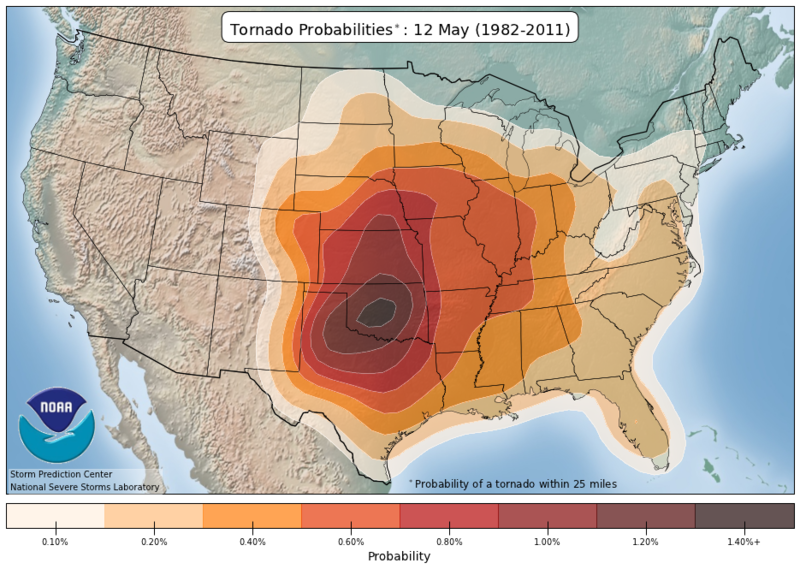 Tornado Probability 6 May 16 May 17 May 23 OKC $2400 NOW BOOKING! 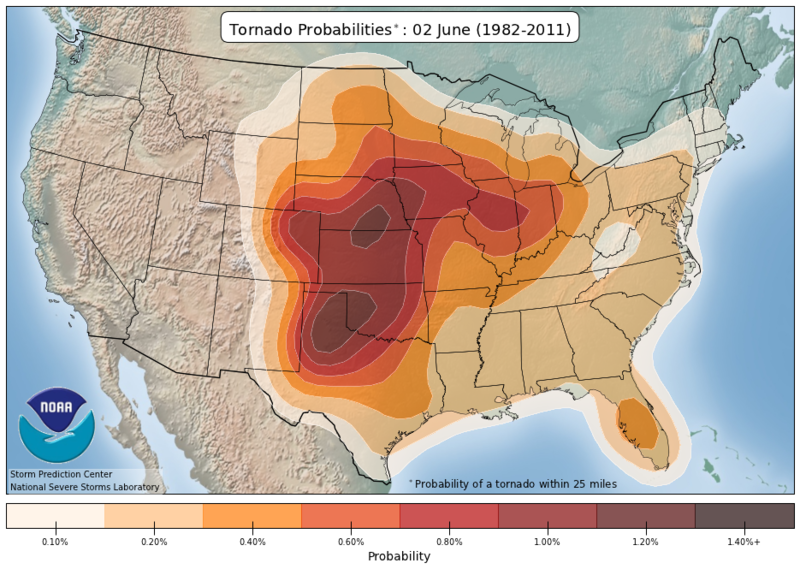 Tornado Probability 6 May 23 May 24 May 30 OKC/DEN $2400 NOW BOOKING! Tornado Probability 6 May 30 May 31 June 6 DEN $2400 NOW BOOKING! 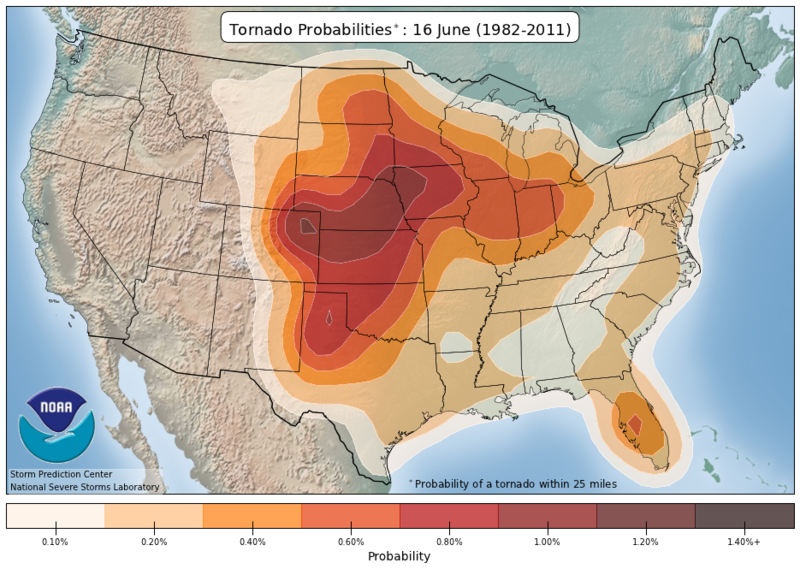 Tornado Probability 6 June 6 June 7 June 13 DEN $2400 NOW BOOKING! Have a small group of 3 people or more? Private tours are available after June 13th, 2020. Please email us your group size and the number of days your group wants to go storm chasing. Those on private tours pay for their own hotel rooms. Sharing a hotel room with someone else during your storm chasing tour? You and your roommate will receive a discount! Please note that you must find your own roommate before booking your tour. Be sure to enter in your roommate's name to the appropriate box during the booking process when prompted so that we can connect your reservations and give you the discount. You may combine this offer with other discounts listed here. 2019 discount: $100 per person. 2020 discount: $200 per person. Get a $100 discount on the listed tour fee of any of our 2020 storm chasing tours when you book before July 1st, 2019. Enter "2020 $100 Early Bird" into the Discounts & Coupons box when booking to receive your discount. Only valid on new 2020 tour bookings made between April 14th, 2019 and July 1st, 2019. Storm chasing tours include 6 days of storm chasing, 5 nights of lodging, and ground transportation during the tour. You will need to book and pay for your own hotel room for both the night of your arrival and the last night of your tour as it is not included in the tour price. All other nights between are included. Hotel details will be furnished during the reservations process on this website and your independent hotel reservations should be made as soon as you send your deposit in for a storm chasing tour. A non-refundable $1000 per person fee is required to reserve your place on a tour. The remaining balance, the full tour fee minus the deposit fee you've paid, is due via mail by April 1st, 2019 for 2019 tours or April 1st, 2020 for 2020 tours. Information on paying your $1000 per person deposit will be presented to you during the booking process. This deposit must be paid online to reserve your tour seat. The rest of your tour fee (full tour fee minus $1000 deposit) in the form of personal check, cashier's check, or money order (all in US Dollars) is due by mail April 1st, 2019 for 2019 tours or April 1st, 2020 for 2020 tours. Send payment to the address listed on the Contact page of this website. If you are outside the USA, express mail is recommended so that payment arrives prior to April 1st. If you would like to pay the rest of your tour fee online via Paypal, you may email us (via the Contact page of this site) to request to have an invoice sent to you. Note that there will be a 4% fee added to all Paypal payments. If your tour fee is not paid in full by April 1st of your tour's year, your tour seat will be re-listed for sale and your deposit fee will be forfeited. We cannot refund your deposit for any reason and the those funds cannot be used for the next year's tours. No exceptions! No refunds! Do not book until you are sure. Airfare is not included with a storm chasing tour. Please make sure you are selecting the correct year of your tour and the correct dates when booking flights. Search for your airfare now, click here. Need a hat or t-shirt for your next storm chasing trip? Look no further than the Storm Chasing Adventure Tours Store!